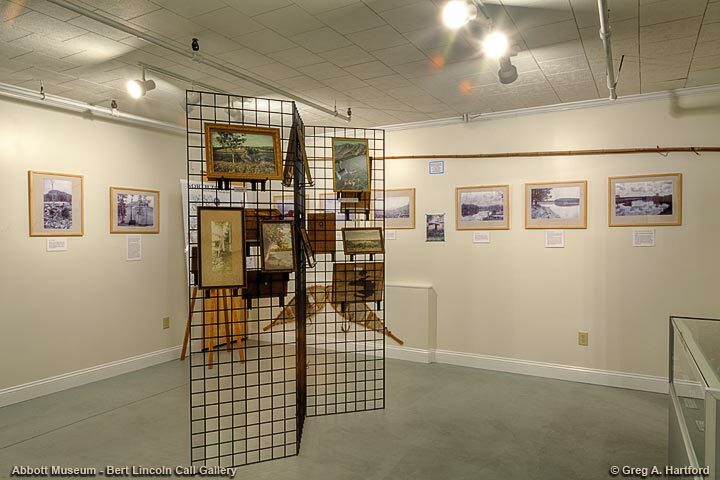 Abbott Museum has an impressive collection of historical artifacts spanning the history of Dexter, Maine in Penobscot County. Much larger than it appears from its main entrance on Church Street, the museum includes seven historically themed exhibits on the lower level alone. Those cover veterans of all wars, history of woolen mills, FayScott machine shop and foundry, North Woods photos (1916-1940), products made in Dexter, an old barber shop, and a local sports Hall of Fame. The location also serves as a tourist information center with an added gift shop. People interested in researching their family history will be pleased to find an extensive genealogy collection and a specific room for reading and study. In addition, the building is the official headquarters of the Dexter Historical Society. 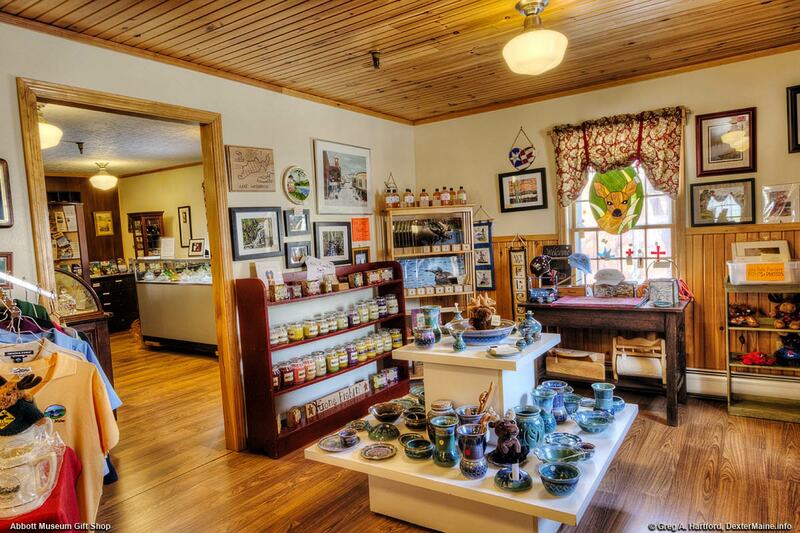 As you enter the museum from Church Street, you will be standing in the museum gift shop where you will see several hundred different “Made in Maine” arts & crafts as well as a wide selection of relevant publications by a diverse list of Maine authors. Items include artwork (both paintings and photography), pottery, t-shirts, candles, wall hangings, jewelry, post cards, calendars, knittings, etc. The purchase of these items is greatly appreciated sinceit will help support the efforts of the Dexter Historical Society and the many local crafts people, artists, and authors. Feel free to look around and ask questions. Besides this initial area, there are several other rooms that follow. The main exhibits are actually on a floor below this one. The stairway to these is straight ahead up the hallway on the right side. 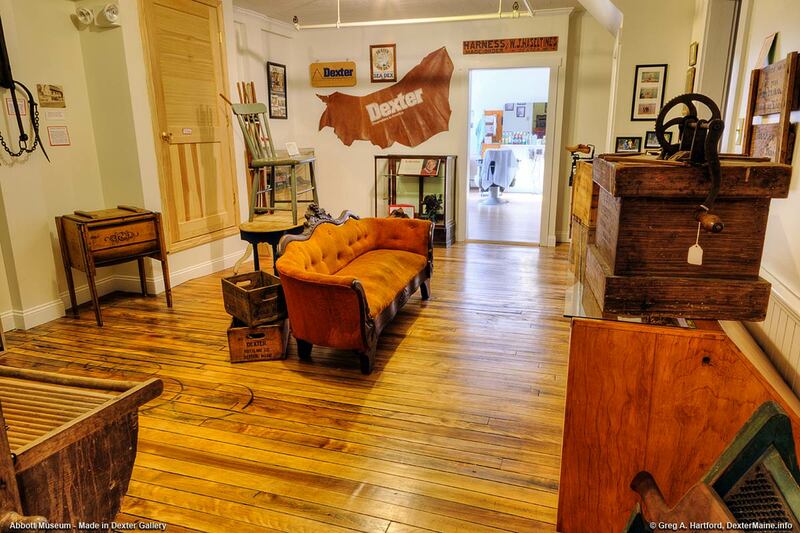 The Tillson Room - This exhibit displays just a few of the wide variety of “Made in Dexter” products that have been created by it quality artisans spanning over 150 years. Like so many other frontier communities of the early nineteenth century, most items had to be created locally. This ensured the good health and survival of the community at large. Most businesses relied on the waters of Lake Wassookeag that flowed south via the East Branch of the Sebasticook River as its lifeblood and power source. Included in this exhibit are items such as locally produced furniture, a butter churn, harnesses, boxes from the Dexter Bottling Company, and a display that tells the story of Dexter Shoe Company. Actual historic period photographs are on the walls to help tell the story. 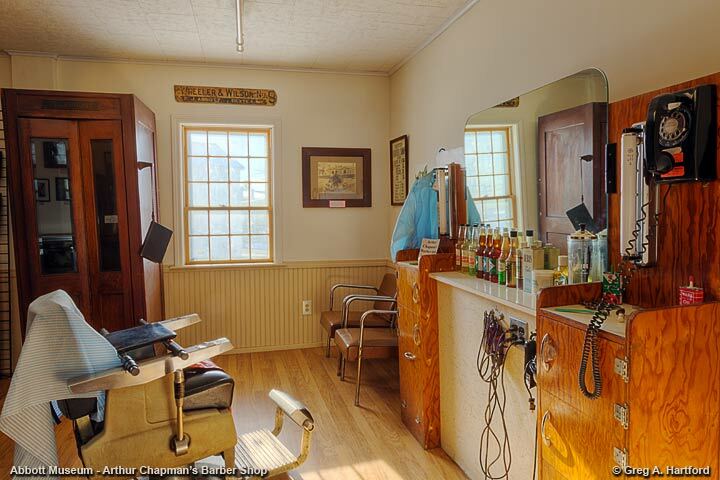 For 35 years beginning in 1965, Arthur Chapman’s Barber Shop on Liberty Street in Dexter, Maine was not only where one got an excellent haircut and shave, it was a place to socialize and discuss the issues of the day, whether it be local gossip, state or national news. Just viewing the tools of the trade brings back a wave of memories of the first haircut experienced at a professional barber as opposed to those done by mom and dad, or by an uncle that happened to stop by at an unfortunate time as I once was subjected to. This display shows an impressive attention to detail and is a journey back in time you should experience. 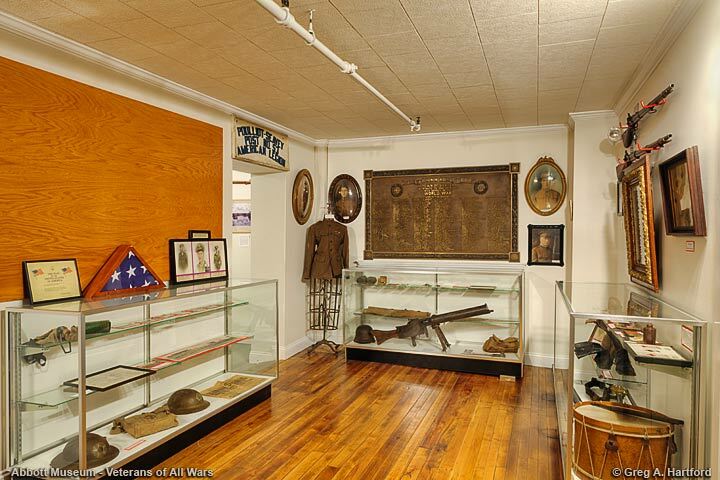 Lysander Cutler Room - The “Veterans Room,” located on the lower level, is a very special display that honors all Dexter, Maine veterans from the American Revolution, the Civil War, World War One and Two, the Korean War, and Vietnam War through present times. A Roll of Honor on one of the walls lists local veterans who served in these wars. There are a variety of artifacts on display including period rifles, a machine gun, knives, bayonets, helmets, a drum, uniforms, flags, medals, and more. Dexter’s Veterans group and Abbott Museum sponsored the exhibit along with the aid of the TriCounty Technical Center Building Trades class in Dexter who constructed the display. Call-Reed Room - In 1886 at the ripe young age of 20, Albert “Bert” Lincoln Call left his family’s farm in nearby Exeter and moved to Dexter where he planned to apprentice with local photographer, A.G. Fassett for three months. Fassett was so impressed with Bert that, rather than continue with the apprenticeship agreement, he chose to hire him as an assistant instead. By November of that same year, Fassett sold his photography business, including the building, to the then 21 year old Bert Call for $1,000. Bert photographed the people and businesses of Dexter and surrounding areas. In 1888, he also began venturing into the central and northern Maine wilderness areas made famous by Henry David Thoreau, capturing its rugged and unspoiled beauty just thirty years after Thoreau’s visit. Bert Call continued his photography business for 58 years until closing in 1944. Visit Bert Lincoln Call. It is remarkable when one considers the historical events surrounding just this one building. When an old tree is cut down and we count the rings, we are often surprised at how many years it has lived. For man-made structures, it can take much more research to learn, not only its age, but what events occurred during its lifetime. There were a few big surprises here. For example: It was originally constructed in 1836 where the current Town Hall is situated. During a 1856 Town meeting that was taking place on the 2nd floor, the 2nd and 1st floors collapsed into the basement. The building was then sold in auction to Amos Abbott & Co. Woolen Mill and moved to its current location where it was repaired and used for offices and storage until closing in 1975. It became Abbott Museum and the headquarters of the Dexter Historical Society in 2004.